Afront a glittering silver backdrop, Alexandra, resplendent in a rather fetching see-through thing-a-ma-jig pouts for the camera. Guest rapper Laza Morgan comes in and spews something that’s clearly not in English, ‘Lex bangs out the obligatory ‘Red One’ line for all songs crafted by the in-demand producer (a little like ‘Darkchild’ did years ago) and the scene is set for another tasty pop number. There’s plenty of flesh on show, with plenty of fitty fitsers for the laydees and the gay boys and Alexandra’s sure looking mighty fine too, but the song? Melodically, it borrows from the classic ‘Iko Iko’, Laza does some more reggae-rap that’s near on inaudible and, well… Meh. 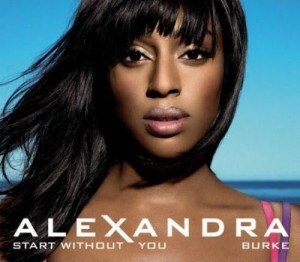 The rap is horrible but I quite like the song, and Alexandra is just gorgeous as always. it took me a while to get used to this song, but for the last couple of weeks I’ve been listening to it non-stop. It’s a real grower.